We are on hand to help. Identify Plumbing & Drainage have highly skilled and trained engineers on hand for the installation, servicing, emergency repairs or replacements of Saniflo's and surface water pump systems. Identify Plumbing & Drainage operates throughout Sussex, Surrey and Kent we provide a 24/7 emergency call out service with a 1 hour emergency response time to all commercial and domestic customers. Our aims is to provide our customers with peace of mind that when something goes wrong with their pump, it will be dealt with quickly and efficiently. Identify Drainage & Plumbing understand the urgency when a macerator stops working. Rest assured our engineers will have encountered most of the problems that can occur and will be on hand to fix the problem, quickly and efficiently keeping it hassle-free for the customer. 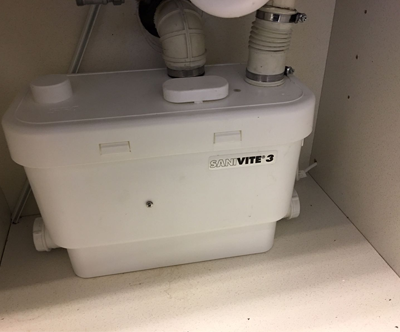 A Saniflo system can be a great workaround for places where you need a toilet but you are not close enough to the mains drainage pipe. Our expert engineers can quickly and easily repair or replace existing Saniflo systems where required. Our engineers are friendly and polite and will always work hard to get the job done to a high standard. When pump stations fail, the effect can be devastating, especially when it is a domestic system in a basement location. Identify Drainage & Plumbing understand how important it is that the system works correctly, we are able to offer repairs and maintenance on all types of pumps and will be happy to visit your property to investigate, identify and resolve the problem. From minor inspections and maintenance to larger repairs, installations and replacements, we are fully equipped to help.